Vote for "VMware Insight (Pranay Jha)" if you Like my Articles. vSphere-land.com is organizing a Top vBlog Voting Competition. My blog “http://vmwareinsight.com” is also part of the Contest. Let me get the awkward part out of the way. Yes, I am seeking votes, but in a quintessential way. I will simply say that only if you really like my articles, I'd be delighted if you would participate in Voting. 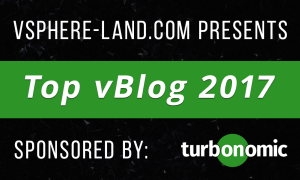 Take your time to review all blogs listed under vLaunchPad and give your vote to top 12 bloggers whom you follow the most. It boost the moral of each blogger as it requires dedication, time & efforts to come up with Topics, Contents, Ideas to write about. So how do you Vote? Visit Top vBlog 2017 - http://topvblog2017.questionpro.com/ and Click on Next in bottom of Page. Out of given list, Select your 12 favorite blogs, you must select exactly 12 to continue. In Next Page, you will get all 12 blogs that you choosed. Give rating from 1 to 12. Where #1 ranking getting 12 points, and #12 ranking getting 1 point. In Next Page, Choose your favorite bloggers/blog under different category. You can also search by name. Provide your Name and Email Address. Click Submit. This is just for validation and will not be shared. Thanks for visiting here. Share this article if you found it useful. Thank you for visiting my profile. I am Pranay Jha, bring along a total of 11+ years of extensive experience with me in Information Technology sector for organizations from small business to large enterprises, wherein my current assignment I am associated with IBM as a Technical Solution Architect for Virtualization platform. I am vExpert x 3 (16/17/18), VCIX-DCV, VCAP5/6-DCD, VCAP5-DCA, VCP7-CMA, VCP5/6-DCV, VCA-DCV, VCA-Cloud, VSP, VCE-CIA, MCITP, MCSE, MCSA(Messaging). I am also an Independent blogger and founder of http://vmwareinsight.com and https://cloudpathshala.com. I can be reached via email at pranay1988jha@gmail.com or Direct Message via Contact Us form. © 2019 - VMWareInsight.com. All rights reserved. The content is copyright to VMWareInsight.com and its authors and may not be reproduced on other websites without permission from VMWareInsight.com.